IT ALL STARTED OUT WITH MY FIRST HOUSE THAT I DREW THAT LOOKED LIKE AN IGLOO WITH A CAT GOING UP THE SIDE. THE FIFTH GRADE WHERE I WAS SELECTED TO DO A MURAL OF THE SPANISH EXPLORATION OF AMERICA. I NEVER COULD MAKE THE FIGURES LOOK RIGHT, WHERE AS JERRY THE CLASS ARTIST COULD DRAW ANYTHING, I THINK HE ENDED UP AT ART CENTER AND THEN ON TO THE FLINTSTONES . MY RESEARCH WITH MY GRADE SCHOOL CRONIES AT WEST WOOD GRAMMAR SCHOOL, DENNIS AND TOM, PRODUCED ONLY JERRY’S FIFTH GRADE CLASS PICTURE. THE POINT BEING DRAWING REALISTIC OBJECTS TO A LARGE DEGREE IS IN THE GENES, SURE YOU CAN LEARN IT LIKE ME, BUT THE BLESSED ONES WITH THE NATURAL TALENT ARE THE REAL ARTISTS. UNIVERSITY OF OREGON REQUIRED SOME LIFE DRAWING AND I TOOK IT AT UCLA ONE SUMMER. I WAS QUITE GOOD AND CAPTURED THE AGING OF MY FATHER JUST BEFORE HE DIED. AT OREGON DRAWING WAS HARD FOR ME, IT WAS ALL SO TORTURED AND STIFF. BUT WHEN I GOT IN ARCHITECTURAL OFFICES I REALIZED TO SELL MY WILD IDEAS I HAD BETTER START TO LEARN THE CRAFT OF DRAWING TO PITCH MY IDEAS. I GOT SERIOUS, BUT STILL JUST DREW THE PEOPLE FROM THE BACK, BECAUSE IT WAS TOO DIFFICULT DRAWING FACES. I WAS WORKING IN ALAMEDA CALIF. ON TEMPORARY LOAN FROM ANOTHER ARCHITECT IN A ONE MAN OFFICE THAT WAS PITCHING SOME CIVIC BUILDING. I WAS DRAWING PEOPLE FROM THE REAR AGAIN AND THE PRINCIPLE SUGGESTED I COPY THEM OUT OF MAGAZINES OR THE PAPER. 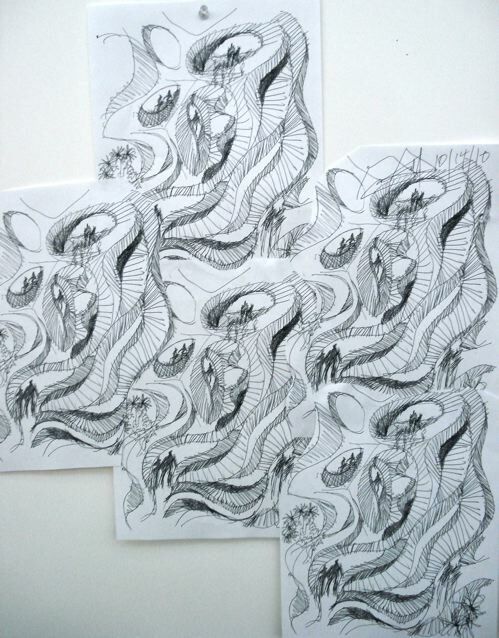 THAT WAS ALL SO FOREIGN, COPYING, STEALING SOMEBODY’S ELSES SKETCHES. TO MY AMAZEMENT IT WAS EASY TO DO, AND IN NO TIME I HAD A FOLDER OF PEOPLE AND ANIMALS THAT I USED TO TRACE FROM. I DID A COMPETITION FOR SAN FRANCISCO CIVIC CENTER AND HAD HOWARD BAKEN AND THE LATE BRUCE ROSS, BUDDIES FROM OREGON HELPED ME RENDER. THEY LATER FORMED THE RENOWN FIRM OF ,BAKEN ARIGONNI AND ROSS . BAKEN REALLY KNEW HIS STUFF AND RENDERED A BEAUTIFUL PERSPECTIVE THAT I HAD LAID OUT FROM A PROJECTED PHOTO OF THE THE DESIGN MODEL . THE DESIGN AND DRAWING CAME OUT GREAT, I SHOULD HAVE WON, BUT LOST TO SOME DESIGN THAT LOOKED LIKE LINOLEUM TILES STACKED UP WITH INSCRIPTION OF THE HISTORY OF SAN FRANCISCO. 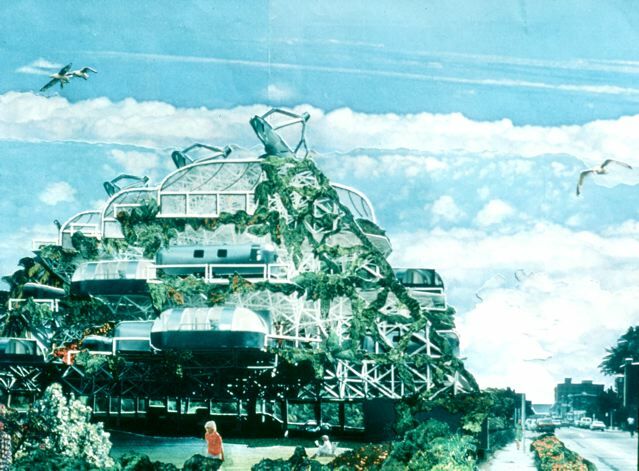 IT WAS SO UGLY THAT IT NEVER GOT BUILT. 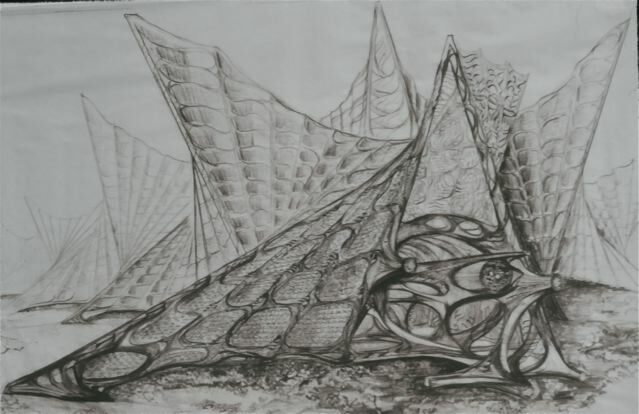 AT CRANBROOK WITH MY MASTER THESIS ON THE VERTICAL CITY FOR DETROIT LATER TO BECOME BIOMORPHIC BIOSPHERE FOR LOS ANGELES I TOOK DRAWING SERIOUSLY. IT WAS ALL A WAY OF CONVEYING MY MESSAGE. I WAS FORCED TO LEARN. THIS WAS NOT THE ERA OF THE COMPUTER, THIS WAS WITH YOUR HAND AND RAPIDOGRAPH PENS THAT WERE FOREVER GETTING STUCK WITH INK CLOGS. THE ABOVE DRAWING WAS HUGE AND I USED SOFT PENCILS WAVING MT ARMS ABOUT WITH SWEAPS ACOSS THE PAPER. HARVEY FERRERO WAS THE BEST AT THIS, I MARVELED AT HIS SKILL. IT WAS SO EASY FOR HIM. I THINK HE TAUGH ME SOME THREE POINT PERSPECTIVE TECHNIQUE THAT I MASTERED. DURING THIS TIME I DID THE DETROIT STUFF, SEE MY BLOG. THE NEXT AWAKENING WAS WHEN I STARTED MY OWN PRACTICE IN VENICE CALIFORNIA DOING APARTMENTS. THE COVER SHEETS ON THE PLANS OFTEN BEING A RENDERING. 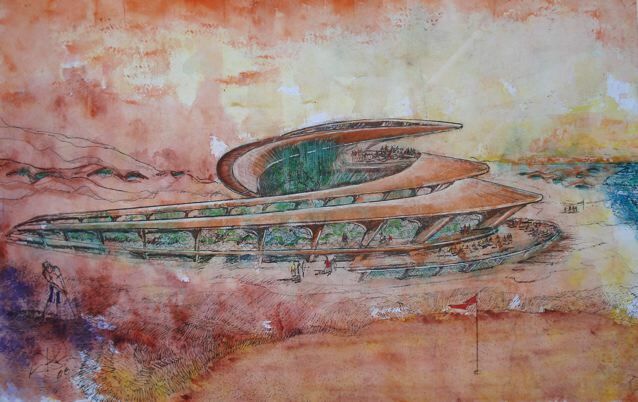 I WORKED ONE SUMMER FOR JOHN LAUTNER ON THE BOB HOPE HOUSE AND I DID TWO GREAT RENDERINGS. THE INTERIOR LIVING ROOM WAS THE BEST, BUT JOHN DID NOT QUITE FEEL IT HAD THE CORRECT ANGLE OR SOMETHING . HE DID SUBMIT THE EXTERIOR ONE AROUND THE POOL TO SOME GRAPHIC RENDERING BOOK AND GAVE ME FULL CREDIT. 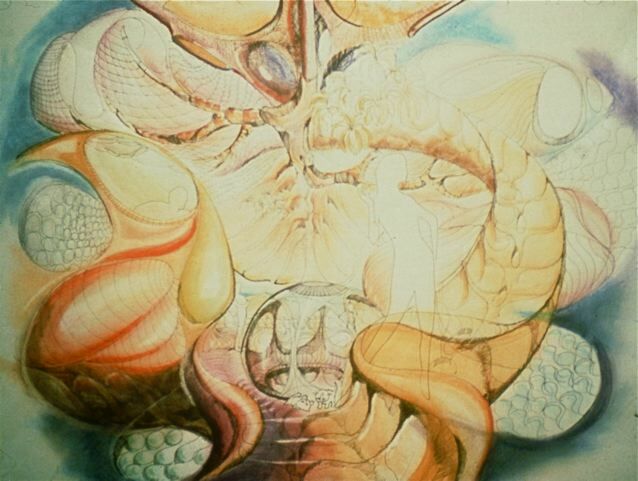 I DECIDED TO GO COLOR AND TOOK AN EXTENSION COURSE OF INDUSTRIAL RENDERING AT UCLA WHERE I HOOKED UP WITH A PROFESSOR, HE LIVED ON A YACHAT AND CUSTOMIZED HIS VOVO SPORTS CAR WITH MAJOR BODY DESIGN LINES. HIS NAME SLIPS MY MEMORY BUT HE WAS WILD. HE TAUGH ME TO HIGH LITE FORMS, SHADE AND RUN COLOR. ONE NIGHT MILICA AND I WERE ON HIS FRIENDS YACHT IN MARINA DEL REY AND WERE STOPPED BY THE HARBOR PATROL. I DO NOT DO DRUGS, BUT THE YACHT WAS FULL OF THEM THAT NIGHT, LUCKILY THE BOAT OWNER TALKED HIS WAY OUT OF BEING BOARDED AND SEARCHED. THOSE WERE THE DAYS WHEN YOU WERE SENT AWAY FOR LONG PERIODS OF TIME WHEN IN POSSESSION. 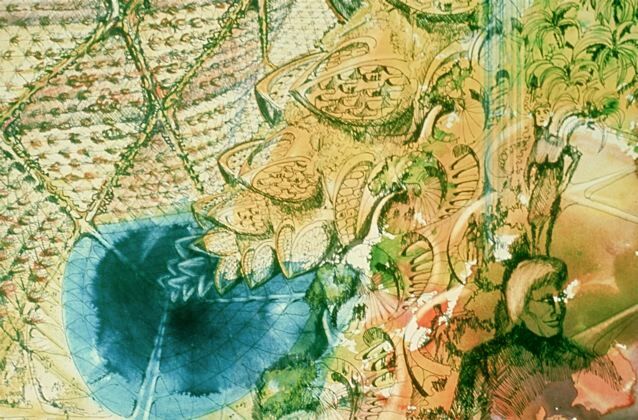 I LOVE SYD MEAD, AND I USED HIS COLOR WASH TECHNIQUE TO DO DRAWINGS FOR THE BIOMORPHIC BIOSPHERE. RECENTLY DID A COLOR WASH FOR AN AQUATIC PARK. I REPLACED DRAWINGS WITH COLLAGES, THIS IS MORE COMPOSING THAN DRAWING. PHOTO OF MODEL, CUTTING OUT OF STUFF FROM MAGAZINES AND ARRANGING AND PASTING. WHAT I REALIZE IT SHUT ME DOWN FROM DRAWING, AND I WENT INTO A LONG DROUGHT. 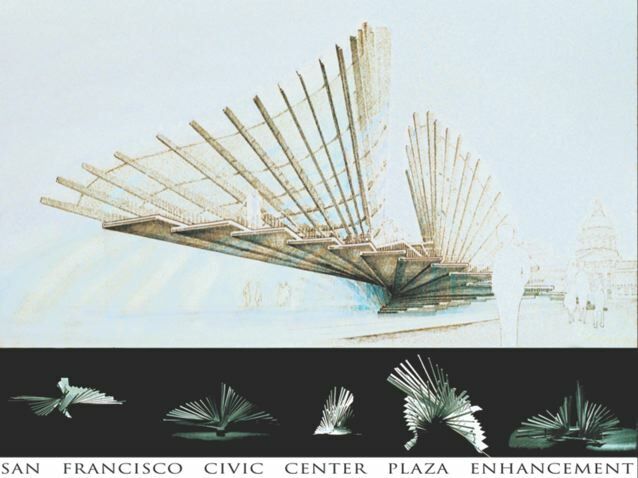 ONLY RECENTLY RESURRECTED BY ORHAN FOR THE INFRASTRUCTURE COMPETITION FOR LOS ANGELES WHERE I DREW OUT OF NECESSITY. GREEN MACHINE 1980, I LIFTED THE OCEAN UP A LITTLE SO YOU COULD SEE IT. THE CONCENTRATING TRACKING COLLECTORS ROTATED, I MESSED UP AND HAD THEM POINTING NORTH WEST IN THIS VIEW. A LATE SUMMER SUN. IN NICARAGUA I TEAMED UP WITH DAVID CADiA TO DO THE COMPUTER RENDERINGS. DAVID COULD COMPOSE ANYTHING WITH INSTRUCTION FROM ME. I WOULD BUILD A QUICK MODEL, TAKE A DIGITAL CAMERA PICTURE OF THE MODEL AND SITE . DAVID WOULD SUPERIMPOSE THE TWO AND WE WOULD TURN THE CRUDE MODEL PHOTO INTO A COLOR REAL LIVE PICTURE WITH ALL THE GOODIES. THIS TOOK ABOUT A DAY FROM BEGINNING TO END. 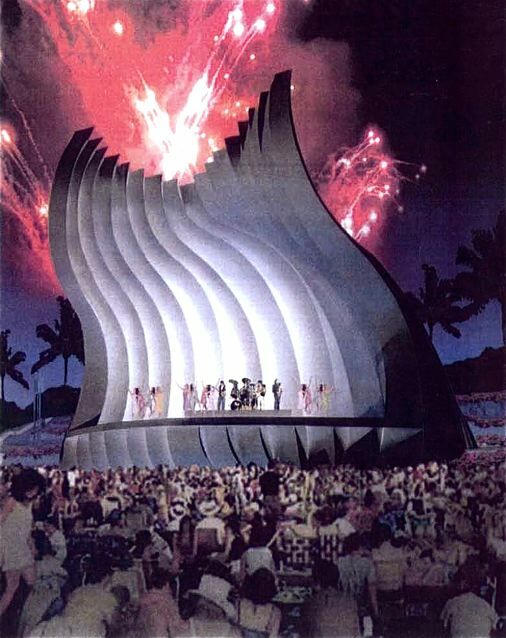 THE IMAGE FOR THE ACOUSTICAL SHELL LOOKED LIKE IT WAS BUILT, SO DURING CONSTRUCTION WHEN FABRICATION MISTAKES WERE MADE I HAD TO MAKE ADJUSTMENTS WITH THE SKIN TO SHOW THE BUILT AS IT HAD BEEN PORTRAYED IN THE IMAGE. THE DRAWING WAS IN CONTROL. I PREFER THE SLICK REALISTIC LOOK DONE WITH COMPUTERS, BUT SOME PROFESSIONAL PREFER THE ARTIST LOOK OF HAND DRAWINGS LIKE I DID ON THE ABU DHABI ECO RESORT. 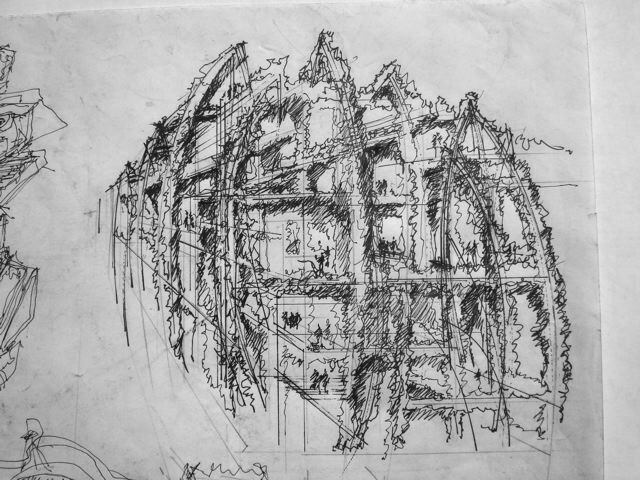 THAT HELPS ME, BECAUSE SO FEW ARCHITECTS CAN DRAW THESE DAYS. A DYING ART THAT WOWS THE WORLD. THERE IS ONE THING I HAVE LEARNED FROM DOING VARIOUS APPROACHES, ANYTHING GOES. BY THAT I MEAN COPY, PASTE, COMPUTERS , FORCED PERSPECTIVE, FUDGE A LOOK, FAKE PERSPECTIVE WITH ELEVATIONS ETC. WHATEVER IT TAKES TO GET A LOOK IS THE NAME OF THE GAME. THERE ARE NO RULES. 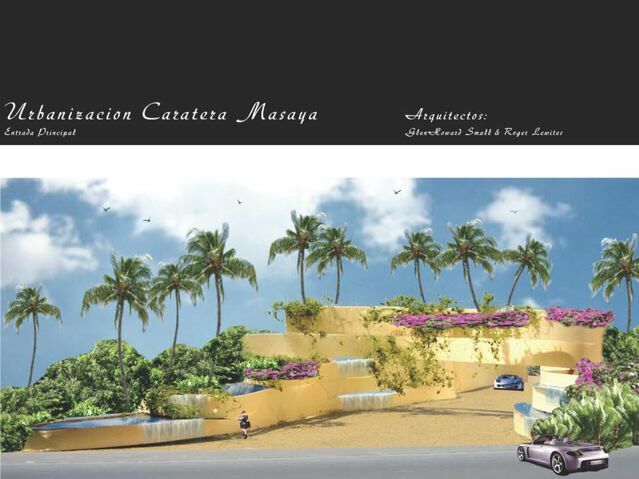 THIS IS FROM AN ELEVATION OF A HOTEL IN NICARAGUA. I USED RUBBER STAMPS TO DO THE TREES. A BIT OF CROSS HATCHING AND SHADOWS TO GIVE IT DEPTH, A FEW BIRDS ALWAYS HELP, PEOPLE AT A DISTANCE ARE EASY. OFTEN WHAT IS LEFT OUT IS THE TRUE TEST OF THE ARTIST. JUST ENOUGH TO LET YOUR EYE READ IN. A PHOTO APPROACH CAN NOT DO THAT. HOUSING COOKIE CUTTER SKETCH 2010. TAKING ONE IMAGE AND DUPLICATING AND SPLICING TOGETHER WITH IDENTICAL IMAGES. THE VISUAL IMAGE BEING A POWERFUL TOOL OF THE ARCHITECT. ALMOST UNFAIR IN A WAY, BECAUSE CLIENTS FALL IN LOVE WITH DRAWINGS AND MISS WHAT IS HAPPENING. I KNOW THERE ARE SKILLED RENDERS DOING GREAT DRAWINGS TO SELL BAD BUILDING. A COMMON TALE. ARCHITECTURE IS A PRACTICAL ART. 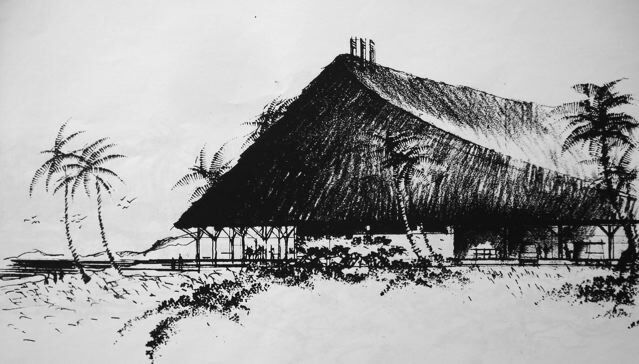 ARCHITECTS THROUGH HISTORY ARE THOUGHT OF AS ARTISTS, SO TO BE ABLE TO SKETCH OUT A LOOK OR DIRECTION ON THE NAPKIN OR THE BACK OF THE CHECK AT THE RESTAURANT WORKS, BIG TIME SELLING TOOL. CONTRACTORS CAN NOT DO THAT, SO THE MYSTIC OF THE CREATIVE ARTIST IS THE ONLY REAL SPELL TO PITCH THAT IS LEFT FOR THE ARCHITECT. MY BLOG MAN, TIM BARNS, FEELS I SHOULD JUST THINK UP IDEAS AND DRAW ALL DAY. THAT IS A POSSIBILITY. IN MANY WAYS MAKES MORE SENSE THAN PRACTICING ARCHITECTURE WITH THE NEXT COMMERCIAL VENTURE. WE JUST TAKE MINI STEPS FOWARD AND BACKWARD HOPING WE ARE ADVANCING IN A POSITIVE MANNER. IN MY LAST BLOG, THERE WAS A PITCH TO DO A RESEARCH LAB AT SCI-ARC. THAT IS UNDER CONSIDERATION. I AM JUST BEING WASTED CREATING PLAY THINGS FOR THE SOCIETY, BUT THAT IS WHAT WE DO AS ARCHITECTS, AND CLIENTS APPRECIATE THAT. BEING DOWN TO TWO SUIT CASES, AND NOW A $400 CAR MAKES ME REALIZE MY SELF ESTEME AND ABILITY TO SKETCH IS NOT ENOUGH TO CONTRIBUTE, I NEED SOPHISTICATED TOOLS TO GENERATE SERIOUS DIALOGUE. AT 74 THERE IS A DEEPTH OF WISDOM THAT MAKES CLEAR VISION. A BOOSTER ROCKET TO CONVEY THE MESSAGE WOULD BE COOL. MARK TWAINE HAD A WAY OF CONVEYING HIS MESSAGE WHILE LAUGHING AT HIMSELF AS WELL AS OTHERS, I RELATE TO THAT. ARCHITECTS ARE SO UP TIGHT ABOUT REVEALING THAT WE ALL SIT ON TOILETS, LIKE EVERYBODY ELSE, GIVING VENT TO FOUL ORDORS AND SMELL NOTHING. 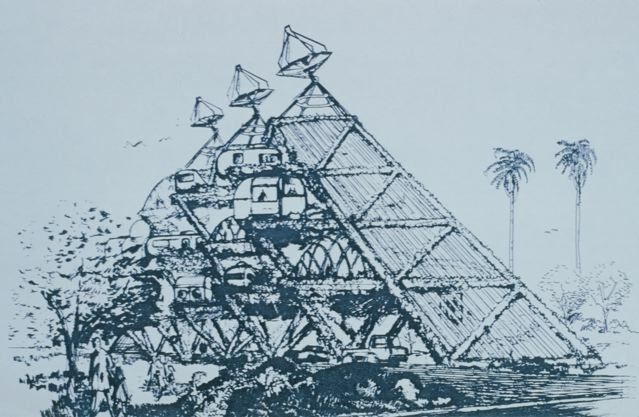 Its interesting that while methods of architectural presentation drawing have increased dramatically with the onset of computer rendering, the core techniques of knowing what to show and hide, and creating a mood with color can be traced far back in architectural history. What do you think of the current presentation work of sci-arc students today when comparing them to what was done years ago? THE SCI-ARC STUDENTS DO FANTASTIC GRAPHIC PRESENTATION. THAT IS WHAT BLEW ME AWAY, BECAUSE I RELATE TO ARTISTIC RENDERING AND PRESENTATIONS. THE PRESENTATION WHERE MUCH BETTER THAN WHEN I WAS AT SCI-ARC 30 YEARS AGO. IF STUDENTS CAN PUT TOGETHER A COMPLETE PACKAGE OF PROGRAM, STRUCTURE ETC. THEY CAN SEDUCE THE CLIENTS WITH THE REALITY OF BEING IN THE SPACES . A VERY POWERFUL TOOL THAT I WOULD LIKE TO TAPE INTO WITH MY PROPOSED RESEARCH LAB AT SCI-ARC, LAST BLOG. MY VISION IS MUCH MORE THAN JUST DOING THE NEXT BUILDING. AS ARCHITECTS WE HAVE BEEN DOING THAT FOREVER, THE URBAN PLANNING IS THE KEY TO MAKING SUBSTANTIAL POSITIVE CHANGE, PLANNERS ARE NOT EQUIPPED TO SEE VISUALLY, SO THEY ARE NOT QUALIFIED. IT TAKES THE ARCHITECT TO SHOW THE WAY. YES, THE STUDENT GRAPHIC SKILLS AT SCI-ARC ARE SENSATIONAL. Most interesting blog. I can see that you are not only a great designer, but an even better writer. Love the way you can tell stories about your personal experiences and remember minute details. Hope you get back to teaching at Sci-Arc, because Sci-Arc is where you belong. NO ONE HAS EVER ACCUSED ME OF BEING A BETTER WRITER THAN DESIGNER. I WRITE TO KEEP MY SANITY. NOBODY ON A DAILY BASIS CARES WHAT I SAY, SO I JUST VENT IT ON MY BLOG. THUS I HIT A CORD THAT SOMEBODY OUT THERE CAN RELATE TO. SCI=ARC NEEDS ME BIG TIME, BUT I AM NOT SURE THEY SEE THAT WAY. WAITING PATIENTLY FOR THEM TO SEE THE LIGHT. Sorry for the accusation. I guess there is always a first time. I agree that Sci Arc needs you big time, maybe you should get your past students to write you reccomendations for Sci Arc to see the light. Do take a look at this website, you might be intersted in entering this competition. THANKS FOR THE INFORMATION ON THE COMPETITION. I WILL ENTER. WHAT I SEE OF THE WORK BEING PRODUCED THESE DAYS BY VERY CREATIVE YOUNG DESIGNERS, IS A LACK OF UNDERSTANDING THE CONNECTION TO THE PRESENT. I HAVE COME TO REALIZE THE PRESENT IS NOT GOING AWAY ANY TIME SOON. IT HAS BEEN HERE FOR A LONG TIME AND WILL BE IN THE FUTURE. THE TRICK IS TO MAKE SOLUTIONS THAT COMPLIMENT THE EXISTING WITHOUT RIDICULING IT. OTHERWISE THERE IS A SORT OF SCIENCE FICTION LOOK THAT DOES NOT RELATE NOR I WANT TO BE IN. LOTS OF TIMES WHEN YOU GET TO THE BOOKCASE IN THE NEW HOUSE IT ALL SHOWS UP REAL FAST. THE DESIGNER FORGETS THAT THE BOOKCASE HAS TO BE DESIGNED IN, NOT JUST EXPOSED LIKE THE PRESENT. THAT GOES FOR FURNITURE ETC. THERE IS A WAY OF VISUAL LIVING THAT CAN NOT PLOP THE AVERAGE BARBIE AND TOM INTO. Hi Glen, Nice piece of writing. 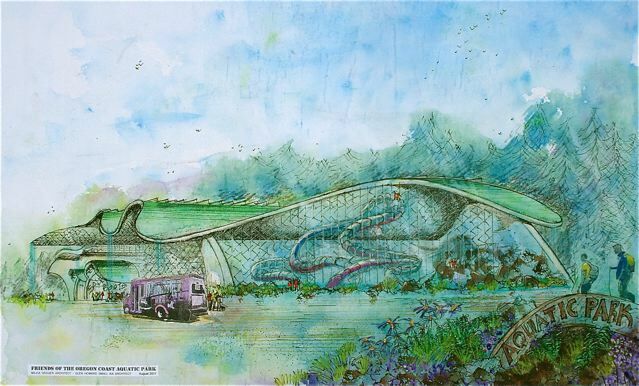 Any more drawings of the Aquatic Park? The wiggle roof reminds me a bit of the Palmdale project. I DID A COUPLE OF OTHER DRAWINGS, ONE THE INTERIOR AND ONE THE ENTRANCE. BOTH RENDERING NOT UP TO MY STANDARD. SO I WILL NOT SHOW THEM. BUT THE BOTTOM LINE IN THE PROJECT HAS GOT A LOT OF POSITIVE INTEREST, AND THERE IS A GOOD POSSIBILITY THAT WE WILL MOVE FOWARD WITH MORE DETAILED INVESTIGATION. THERE WERE A LOT OF PALMDALE SCHEMES, I THINK YOU WERE REFERRING TO THE REMODEL OF THE OLD HIGH SCHOOL. YES THERE IS SOME OF THAT. BUT THE AQUATIC CENTER HAS THE REVERSE BARREL VAULT AS WELL AS THE TYPICAL VAULT. ALL PRATICAL STUFF TO KEEP THE COST DOWN AND STILL GIVE A LOOK THAT GRABS YOU. The downtown arts center might be what i was thinking . 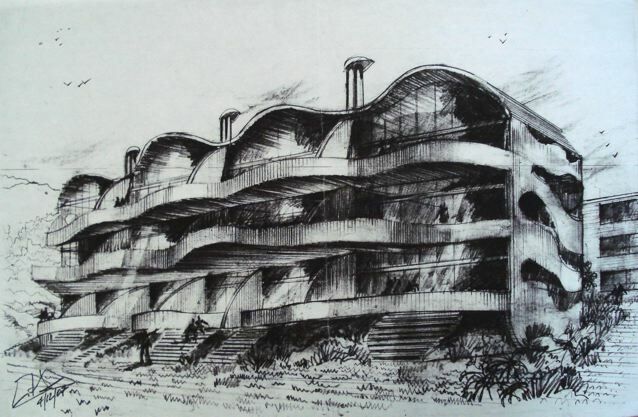 If I remember, the model had a barrel vault type thing, an undulating fascia. Steve Alpert worked on it too. Good to know that you are planning on entering the competition. Waiting to see what you come up with. THE BRAIN IS IN PROCESS, WHAT I WILL SAY IT WILL BE DIFFERENT. LOVE THE IDEA OF THINKING BIG. THE BRAIN IS THROWN INTO HIGH GEAR. Are you finally planning on doing hand drawnings or getting an X student to model it on the computer? As the board size is 24″ x 48″ in jpg format, you would need to work out how you would scan your hand drawings onto the computer and achieve the required resolution. THE LATE FRED HAINES TOLD ME WHEN THE PC WAS JUST GETTING STARTED THAT IF YOU READ CAREFULLY THE COMPUTER RESPONDS. I AM A LOUSY READER, SO IT TAKES AWHILE TO GET ON TRACK. I REALIZE THAT I NEED A $65 FEE TO REGISTER, I HAVE NOT DONE THAT. SO MY REGISTRATION MUST WAIT. LOOKING AT THE PAST WINNERS WAS DISHEARTENING. ADVENTURSOME, BUT VERY UGLY AND AND LACKED EFFORT OF EASING INTO CHANGE WITH RESPECT FOR THE EXISTING. Don’t agree with your view of past winners. Many of them were fantastic. Also don’t agree that they need to “ease into change with respect for the existing”. 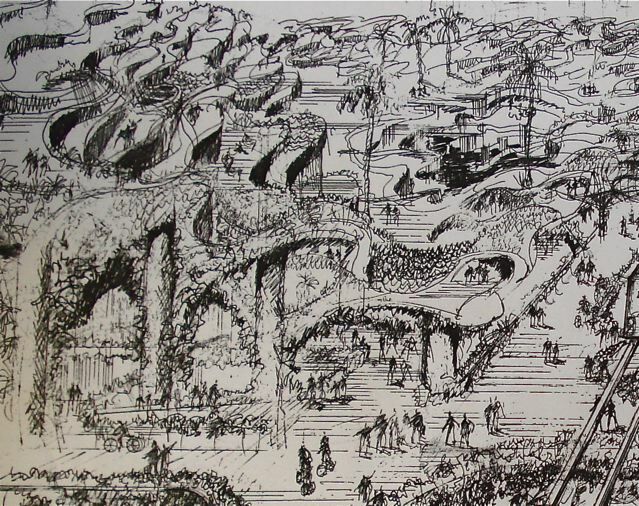 Vertical City, Detroit, 1967, does not have respect for the existing – and in my opinion it does not need too. Anyways, do register before 15 November, as after 15th Nov. the fee increases to $85. NOW HAVING TO DEAL WITH THE REALITY OF PUT UP OR SHUT UP. THE WHOLE CONCEPT OF HEAVY HANDED VERTICAL LIVING IS A CHALLENGE. EVERY TIME I STEP INTO AN ELEVATOR THERE IS A WEIRD THING THAT HAPPENS OF BEING A PRODUCT OF THE MACHINE AGE THAT PUTS ONE ON A CONVEYOR BELT TO DO SOME DUMB TASK TO EARN MONEY. I WOULD SAY LOSS OF IDENTITY IN CONTRAST TO WALKING THOUGH THE GRASS. I HAVE SPENT THE BETTER PART OF MY LIFE PROPOSING CONCEPTS TO COMBINE THE MAN MADE TECHNOLOGY WORLD AND THE NATURAL WORLD AND REALIZE I MIGHT BE PUSHING A SHERWOOD FOREST HOAX. ARCHITECTS DEAL WITH PHYSICAL FORM ENVIRONMENTS, THE WHOLE SOCIAL STRUCTURE BEING RELATED ,BUT OUT OF OUR CONTROL. SO, DREAM ON WITH NO BASIS. THE FLIP SIDE OF THAT IS TO LET SOME UNINSPIRED ENGINEER ORGANIZE THIS TECHNOLOGY WORLD. WHICH IN MANY WAYS WE LIVE IN NOW. Great post. Always nice to get some great insight from others in the same industry. Hear Glen's latest interview on Root Simple here. There are a series of buttons after each post. These allow you to quickly and easily share posts from this website with your Facebook, Twitter, LinkedIn and other communities online. Doing this helps the website by increasing our visibility, and enabling new readers to find Glen's work. Making a living in this economic environment is difficult for anyone. If you find this blog entertaining, or interesting, please consider a donation. OBITUARY GLEN HOWARD SMALL 1937-? FLASH UPDATE – WHEN WILL THEY EVER LEARN? GREEN MACHINE 3 – WHY NOT NOW? GEHRY’S EISENHOWER – ART OR FARCE? PAPER ARCHITECTURE—REAL OR NOT REAL?